Urban expansion in advanced countries is the result of inherent transformations in settlement forms and socioeconomic functions leading to new metropolitan configurations. Assessing latent shifts from mono-centric structures to more fragmented, low-density and spatially-decentralized models was complicated by emerging processes of urban sprawl. 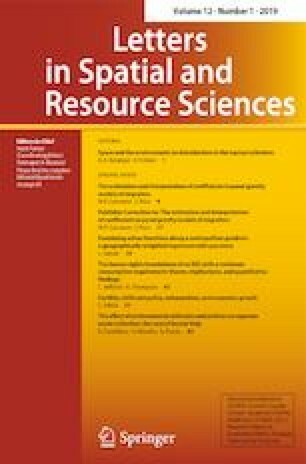 In these regards, the present study proposes an original approach to the analysis of metropolitan configurations using a Geographically Weighted Regression (GWR) to investigate changes in the spatial distribution of specific urban functions over time. This framework was applied to long-term (1920–2010) evolution of three functions (population density, building density and per cent share of built-up area in total municipal area) in a Mediterranean city (Athens, Greece) moving from a mono-centric configuration to a more dispersed settlement model. Local GWR parameters (adjusted R2, intercept, slope, standard residuals) estimated at 4 time points (1920, 1950, 1980 and 2010) constituted the input of a Multiway Factor Analysis reconstructing the intimate dynamics of urban growth in the study area. Local regression slopes and intercepts evidence a non-linear expansion path with the highest spatial polarization in urban and rural districts observed in the early 1980s. Model’s goodness-of-fit increased progressively over time moving from central to peripheral locations. Results of this study contribute to a comparative analysis of the relationship between urban functions and distance from inner cities. This work was supported by a grant of the Ministry of Education of Czech Republic, NPU I(LO1415).